On Christmas Eve we met SP's family at Ya Fei for dinner. SP's mom and her husband are in town for the holiday. Ya Fei is located in Robinson Town Center - the strip mall with the post office, Verizon Wireless store, Jo-Ann store, and the liquor store. We had made reservations and were seated at a large round table with a rather wobbly, unbalanced lazy susan in the center. Everyone quickly poured hot tea to warm themselves (except for me; I don't like oolong). I've only had Ya Fei's food once before. We had some delivered to the house one day back when we were moving in and too busy to cook. It was OK. This time, SP and I decided to share an appetizer of dumplings. There were six large dumpling with the usual dipping sauce. 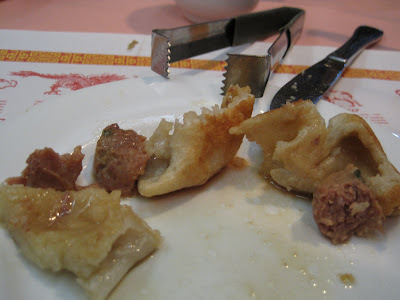 These dumplings were no better/no worse than dumplings I've eaten at other Chinese restaurants. 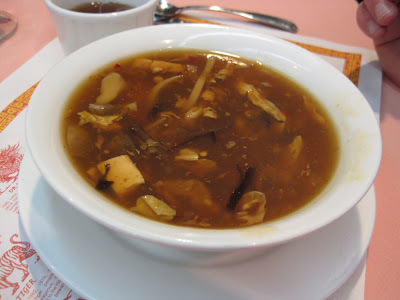 SP ordered Hot & Sour Soup. He said it was tasty. 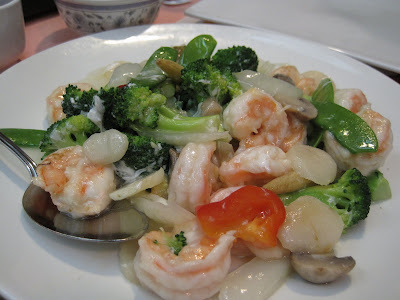 For our main meal, we shared Velvet Shrimp -- 'slices of large shrimp quickly stir-fried to retain flavor with baby corn, broccoli and straw mushrooms; served in a velvety light sauce.' 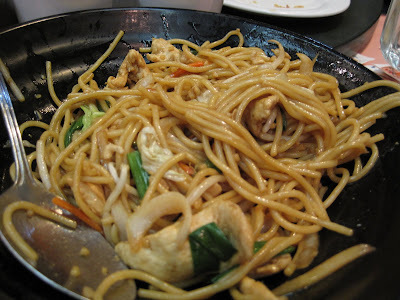 We also shared an order of Chicken Lo Mein. Both dishes were fine. 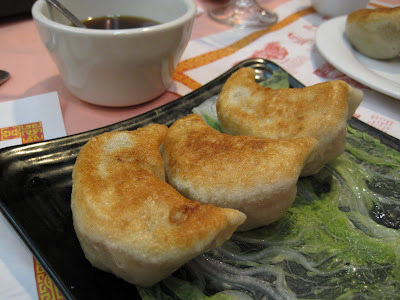 As I said about the dumplings, no better/no worse than similar foods I've eaten at other Chinese restaurants (Sesame Inn, Sichuan House, Pacific Ring). The meal was fine. Would I go back? I suppose if a large group wanted Chinese, sure, I'd go back. But as with other Chinese meals I've eaten in the past few years, it left me feeling somewhat queasy in my stomach. I emphasize all Chinese food for the last few years, not Ya Fei in particular. My sensitive stomach seems to have started being sensitive to Chinese. I'm not sure if it's the grease, or oil, or... whatever. There's something that makes me feel rather ill after I eat it. I didn't sleep well last night because my stomach was not happy. So I would only go back if I was part of a large group that wanted to eat Chinese.